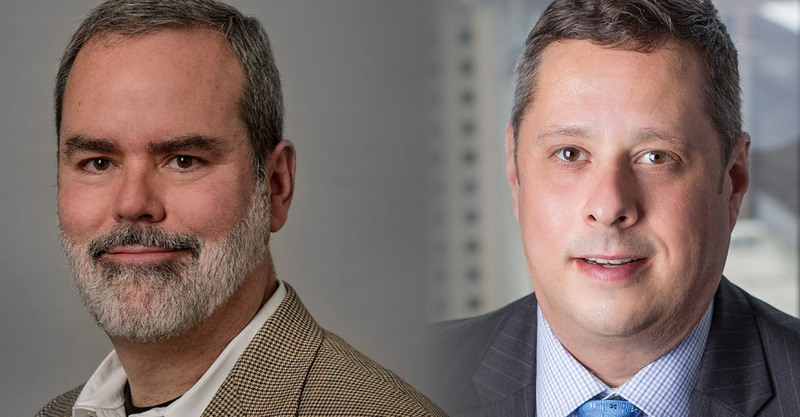 Experienced patent litigators Garland Stephens and John Lane are well used to the courtroom along with the patience required to guide clients’ cases through the civil justice system. But they marvel at the “inner strength” another client, Sherwood Brown, used to endure 22 years on Mississippi’s death row for a 1995 triple-homicide conviction. A DeSoto County jury convicted Brown of the 1993 murders of 13-year-old Evangela Boyd, her mother Verline Boyd and grandmother Betty Boyd. Key evidence in the case was a bite mark on Brown’s hand and shoe prints found at the crime scene. DNA testing was not widely used at the time but was central to the pro bono work led by Stephens of Weil Gotshal, Lane of Fish & Richardson, both based in Houston, and lawyers at the Mississippi Innocence Project. DNA evidence eventually showed that Brown’s DNA was not present in victim saliva and that the blood on his shoe did not match that from the crime. After an en banc hearing, the Mississippi Supreme Court vacated the convictions last fall and remanded the case back to the trial court; the Supreme Court then denied the state’s motion for reconsideration earlier this year. The attorneys and their client continue to wait for a decision by the county whether to retry the case. Lawdragon: When and how did this case come your way? Garland Stephens: Weil Gotshal & Manges pro bono coordinator, Miriam Buhl, received a request from Sherwood’s former pro bono attorney, Eleanor Jackson Piel, for assistance. Ms. Piel had been representing Sherwood in post-conviction matters and was looking for pro bono assistance with the case. I agreed to work on the case and shortly after that, John Lane agreed to help. LD: What characteristics of the case led you to want to take it on? Did you have any reservations? GS: I was struck by how little evidence there was of Sherwood’s guilt. The primary evidence on which he was convicted consisted of a bite mark, a bloody shoe print, and testimony by a witness who admitted that he had changed his story several times. Sherwood consistently maintained his innocence and there was credible testimony that he was at home at the time the murders were committed. Sherwood told me that he did not commit the crime, and I believed him. I have never had any reservations about representing him. LD: I know this effort has lasted several years, and involved multiple organizations. If you can, please describe the team that has worked on this effort. Also – do you or the firm know how many pro bono hours the firm has devoted to this case? John Lane: It has been a team effort. Garland works at Weil, Gotshal & Manges and I work at Fish & Richardson. We’re both patent litigators, but have worked on the case pro bono for over nine years now. Along the way, we’ve had various other attorneys and staff at our firms pitch in and help. At the end of 2011, I had a question about the case. I don’t remember what the question was, but I called Tucker Carrington out of the blue. He is a professor at the University of Mississippi Law School and also heads up the Mississippi Innocence Project. We chatted on the phone awhile, and it ended up after a few more calls that the Mississippi Innocence Project became our co-counsel and threw its full weight behind the case. That was really a big turning point. Tucker is fantastic lawyer. At that time, there was also a young lawyer at the Innocence Project named Will McIntosh. Will was instrumental in investigating the case. He had a very folksy way, and really a gift for getting witnesses and Sherwood to open up to him. He also did a lot of heavy lifting on the original motion to have the DNA tested. It was a very long and complicated motion. Will is now at a public defender in Athens, Georgia. Recently, Sandy Levick joined Tucker at the Innocence Project. Sandy and Tucker used to work together at the Federal Public Defenders’ Office in Washington, D.C. Sandy has a wealth of criminal defense experience and is incredibly creative, and a fantastic writer. The lawyers at the Mississippi Innocence Project overall are truly an amazing group. Between all the various attorneys, it’s hard to estimate the number of hours worked on the case, but it’s in the thousands. Perhaps 4,000 to 5,000 hours. LD: Please describe your client to the extent possible. Have you gotten to know him well? What has his attitude been as this long effort proceeded? JL: We’ve gotten to know Sherwood pretty well over the years. I talk to him on the phone just about every week. Sherwood grew up in a small town, Eudora, Mississippi. He was a star football player and a great all-around athlete in his early high school years. But eventually he started running with a crowd that got him headed in the wrong direction. He ended up dropping out of high school, and had several run ins with the law, some of which were serious. At the same time though, he was – and still is – a people person, with lots of charisma. Sherwood loves kids. He has three sons who were very young when he was arrested. They’re all grown now and have their own kids, so Sherwood has five grandkids, but he’s never been able to meet any of them. Sherwood was on death row for 22 years, up until earlier this year. No one can survive an experience like that unchanged. It has been incredibly frustrating for him to put it mildly. He’s been asked again and again to be patient with the legal process, while he sat year after year on death row. His character has been tested many times – beyond what most people could ever imagine enduring – but he somehow managed to stick it out. He’s always maintained his innocence and I think that ultimately is what carried him through and gave him the inner strength to survive. It’s quite remarkable. LD: During the early phase, what was the focus of your investigation? What did you learn that strengthened your efforts to gain access to the evidence for DNA testing? Or, in other words, what was key in succeeding in that motion? GS: We took a broad approach to the case and, over the years we have represented Sherwood, we have spent considerable time investigating many aspects of his case. We consulted experts and textbooks on psychology, shoe print matching, bite marks, serology and DNA along the way. The DNA technology that resulted in the court vacating Sherwood’s conviction did not exist when he was convicted. Eventually, it appeared that there was enough biological evidence remaining to use relatively new DNA testing techniques to assess whether the shoe print and bite mark evidence presented by the state was consistent with the DNA that would necessarily have been left behind if the shoe print and bite mark were what the state claimed they were at trial. The testing showed that DNA was not consistent with the state’s evidence at trial, and the Mississippi Supreme Court agreed. LD: For the average layperson, can you go into some detail on the DNA testing process and what it was like for this case? JL: Every cell in your body contains your entire DNA sequence. It’s like a building with millions of rooms, and the blueprints for the entire building are stored in every room. Various locations on people’s DNA have certain characteristics, like a coin having a heads side and a tails side. The chances of two people flipping a coin and both coming up heads is 25%. The chances of two people flipping a coin twice and all four tosses coming up heads are about 6%. The chances after 20 flips are almost zero. If you imagine some of the coins having three or four sides, the odds are truly staggering – essentially zero. That’s the way DNA testing works. About 15 to 20 specified locations on two people’s DNA are compared. The odds of both having the same characteristics at all the locations are essentially zero. So if they do have the same characteristics at all the locations, the two pieces of DNA must be from the same person. Here, we agreed with the state on a fairly detailed protocol for the DNA testing to ensure it was conducted properly, and the protocol was then entered as an order by the Court. The testing then began, and it was a lengthy process. LD: And why does it take so long? JL: One reason it took so long was because the protocol said the evidence would be tested twice, by two independent labs. So if a piece of evidence would be entirely consumed during the testing procedure by the first lab, the parties had to notify the Court and either agree on a specific protocol for the testing of that piece of evidence, or submit briefs and let the Court decide on a protocol. This happened several times during the first lab’s testing – for example, with the youngest victim’s fingernail scrapings. And then it ultimately turned out, after all that, that there was no definitive DNA results from her fingernail scrapings. Once all the evidence was tested by the first lab, it wrote a report that was submitted to the Court. It was only at that point that a sample of Sherwood’s DNA was gathered. Then his DNA had to be sent to the lab, so the lab could develop his profile and compare it to the DNA profiles that were developed in the earlier testing. And then the lab had to write another report on those findings. There were many other details and disputes along the way – too many to explain in detail here – involving for example Y-STR, which is a DNA testing technique especially adapted for detecting small quantities of male DNA, and CODIS, which is an FBI database of DNA profiles from convicted felons and others. And after all that, the second lab then tested the evidence, which didn’t take as long because its testing was focused on the evidence where the first lab actually found valuable DNA profiles, but it still took several months. LD: Can you describe your reaction, and that of other team members and Mr. Brown, when you learned the results? JL: We were not surprised by the results because we believed all along they would show what they ultimately did show. But it was still pretty striking to actually see the results on paper. And finally having the results, on paper, was the beginning of a new chapter. We now had what we needed to actually go into a court and file a motion to get Sherwood some relief. And that’s what happened. Although it took several years to get to the point where we had DNA testing results in hand, once we got them, Sherwood’s conviction and sentences were overturned by the Mississippi Supreme Court within 15 months. LD: What is the process now for getting him released? When will you know for sure whether DeSoto County will retry the case? JL: Sherwood’s convictions and sentences were vacated by the Mississippi Supreme Court in October 2017. The state filed for reconsideration, but its motion was denied in late January of this year. The case basically has been re-winded back to 1994, just after Sherwood was indicted. In other words, today he stands indicted, based on a 1994 indictment, of capital murder. Several weeks ago, Sherwood was transported from death row to the county jail. That’s where things stand. No prosecutor has been assigned to the case as of yet. That’s what we know today. From here, only time will tell. LD: Is there any memory, lesson or experience that you think will stand out from working on this pro bono effort? GS: I will never forget visiting with Sherwood in the DeSoto county jail on the day after he was released from death row. John Lane pointed out that Sherwood was the only inmate in the jail who was happy to be there and we all laughed. It was wonderful to see Sherwood happy and smiling after so many incredibly difficult years. This case shows how justice can go wrong. I have no doubt that the judge, jury and lawyers in this case all tried hard to do the right thing, and still Sherwood was wrongly convicted. It also shows that perseverance and hard work can set it right. Pro bono work can be the most rewarding work that an attorney can do. Every lawyer should take their obligation to serve the public seriously. It can make a difference, even save a life. There are many more people out there who can use our help. Email Editor-in-Chief John Ryan at john@lawdragon.com about your or your organization’s pro bono story.